All transactions are safe and secure with a reliable history in online purchasing behind each of our associates. 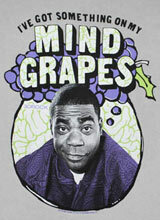 Buy the Mind Grapes t-shirt to own 30 Rock clothing and merchandise. "I've got something on my mind grapes," reads the front of this officially licensed Mind Grapes tee featuring Tracy Jordan (Tracy Morgan). Jack Donaghy (Alec Baldwin) coined the phrase in the 30 Rock episode "Tracy Does Conan" when he's trying to think of a quip to use during his introduction of Jack Welch at a fundraiser. Donaghy reads Liz Lemon (Tina Fey) his joke, which confuses her. Pair it with other Tracy Jordan designs like the The Girlie Show, TGS, or Dark Sensations NBC 30 Rock t-shirt that is perfect for fans who want to expose their affection for the show's coolest character. In addition to the Mind Grapes tee above, browse the 30 Rock Clothing Gallery for more apparel like men's and women's clothes, kids shirts or hoodies.